This Apple Cider Vinegar Metabolism Booster is a simple morning routine that will help you feel good all day long. 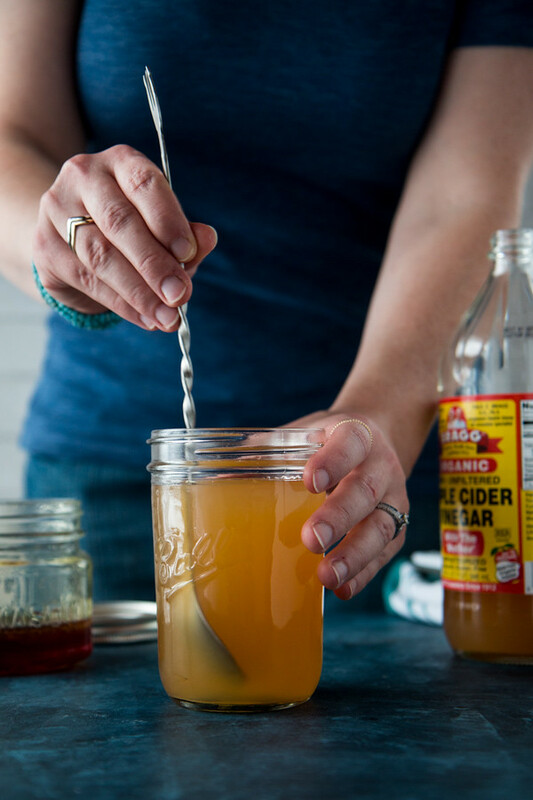 Read on to learn about the benefits of apple cider vinegar, or jump straight to the recipe HERE. Usually I find myself in a rut after the holidays, as if all the heavy holiday eating is literally weighing me down and keeping me from doing anything. 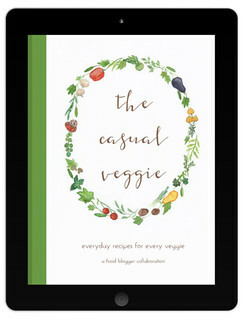 The short, frigid days don’t help my mood either, and the last thing I want to think about is cooking big fancy meals. So I wind up snacking a lot, and promising myself to eat more vegetables just as soon as it warms up a little. Yes, I am no stranger to the “I’m totally going to eat healthy this year” resolution, but most years I come up with a ton of excuses and just… don’t. 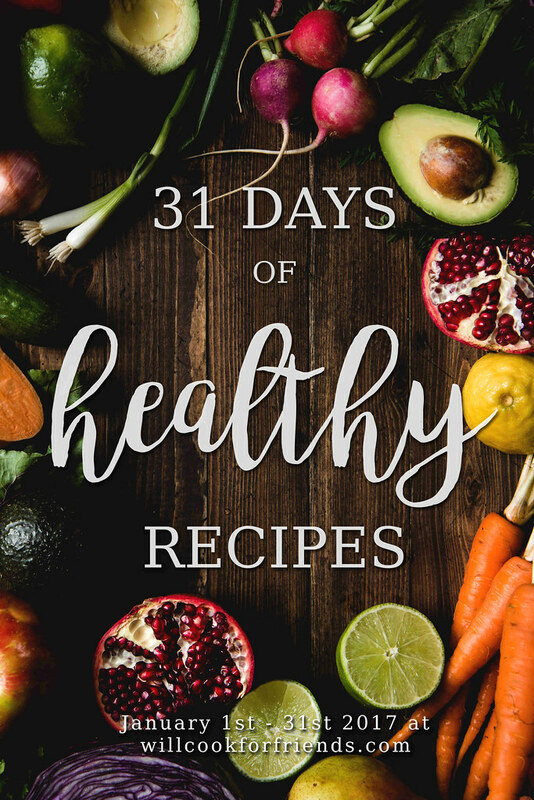 This time, I am kicking off the new year with 31 Days Of Healthy Recipes here on the blog. That’s a new recipe every single day of January. Because I’m a crazy person, but also because I know you guys are wanting light, healthy, easy to prepare meals after the holidays… and so do I! Let’s rock our New Year’s Resolutions together, kay? We’re talking simple, good-for-you food that also tastes amazing. If your goal for this month is anything like mine (to eat healthier and reset after the holidays) then stick around. I’ll also be sharing new posts daily on social media, or weekly on my mailing list. You can find links for those in the sidebar if you’d like to follow along. Most of the recipes coming to you this month are going to be gluten free, many will be vegan (or have a vegan option), and all of them will be simple, inexpensive, and delicious. Okay, except maybe this one. Ha! This one isn’t exactly the best tasting thing I’ve made for you guys (although, if you like the taste of vinegar — I do! — then it isn’t so bad). 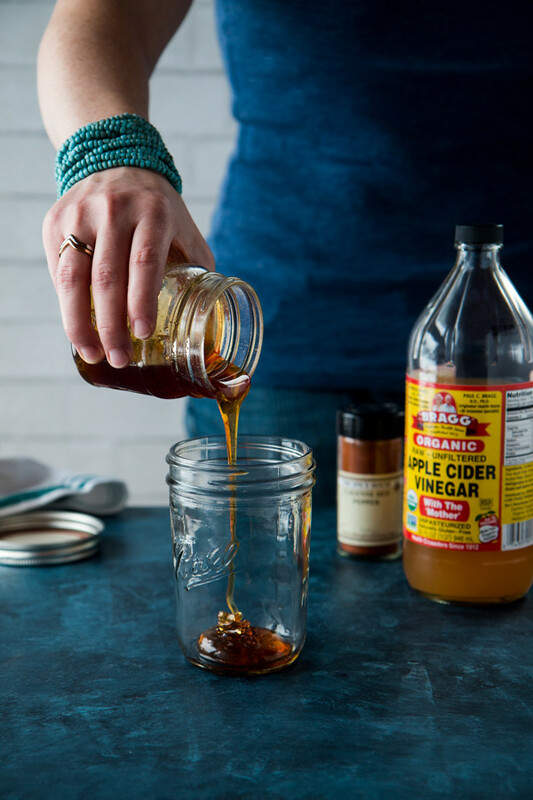 Drinking vinegar is one of those things that isn’t so much about flavor as it is about helping you feel amazing all day long. I’d say that’s a pretty solid trade off, wouldn’t you? I decided this apple cider vinegar metabolism booster would be the perfect way to kick off these 31 Days Of Healthy Recipes, because… hello, who doesn’t need a boost for their metabolism? Taking a swig of this stuff every morning is an easy habit for feeling better, and I plan on drinking it daily during the month of January to help give my tummy a boost. Why apple cider vinegar and not some other kind? 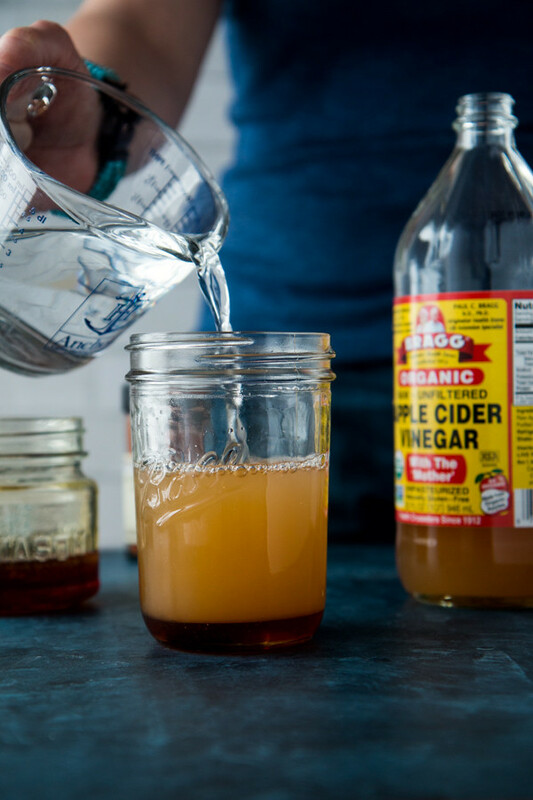 Apple cider vinegar is the easiest vinegar to find these days that’s sold RAW and UNFILTERED. Those are some important words, and even better if the bottle says it contains some of the “mother” — that is, the starter culture that fermented the vinegar. Because this kind of vinegar has not been pasteurized or filtered, it still contains all kinds of healthy microorganisms (aka probiotics). Think of it like kombucha, or other fermented foods, which are good for your gut health. 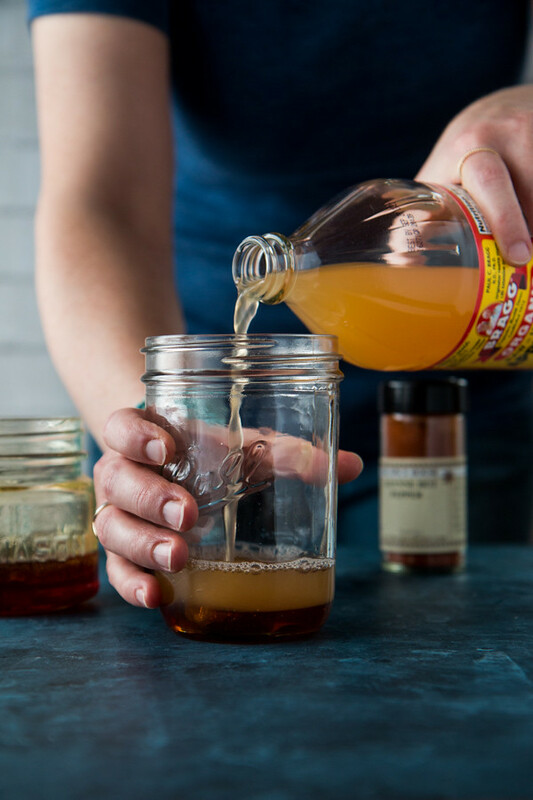 I use Bragg’s cider vinegar because it’s the easiest to find, but if you have another brand of raw unfiltered vinegar you like, you can use that too. So, besides a tiny bit of probiotics, why would you want to drink apple cider vinegar? One of the biggest benefits of drinking a little vinegar every day is that it can help balance your body’s PH levels, and counter all the sugars we get in our normal diets. So, I’m not a doctor or a nutritionist, but here’s how I think of it: when we eat a bunch of sugars, our bodies react by producing more acids, effectively converting sugary foods into acidic ones in our gut. Some foods (including vinegar), do the opposite — they trigger the body to produce less acid, resulting in a more alkaline environment. So drinking something acidic actually helps make the body more alkaline — kind of ironic. That might not seem like a big deal, but it turns out when our bodies are too acidic, they struggle to function as well as they should. Tissues can’t absorb nutrients as well, digestion is less effective, and we’re less likely to fight off diseases and illness. The body actually wants to maintain a slightly alkaline PH, but poor diet and stress can throw it off. A sip of vinegar every day helps gives it a boost in the right direction, and if your PH levels are already fine, is unlikely to do any harm because the body will naturally balance the alkalinity to a manageable level. Cider vinegar might also have some other awesome qualities, though the research in these areas is still young — like reducing appetite (and helping you lose weight), lowing bad cholesterol and decreasing the risk of heart disease, and regulating blood sugar levels — just to name a few. As mentioned earlier, I am not a doctor, scientist, or nutrition expert, so this information is based off my own research and personal experiences. I strongly suggest you read up on apple cider vinegar for yourself if you want to know more, and most importantly, give it a try and see how you feel. This little concoction is not something I invented — you’ll find similar things all over the web — but this particular recipe comes from something my Mom drinks on the regular. She uses raw honey in hers (you could also use pure, grade B maple syrup, if you want to keep it vegan) and just a dash of cayenne pepper. The cayenne is totally a to-taste kind of thing, and can be left out all together if you prefer. But having a little spice run through your system first thing in the morning can help get the blood flowing to all those important organs, and can help kick start your metabolism. 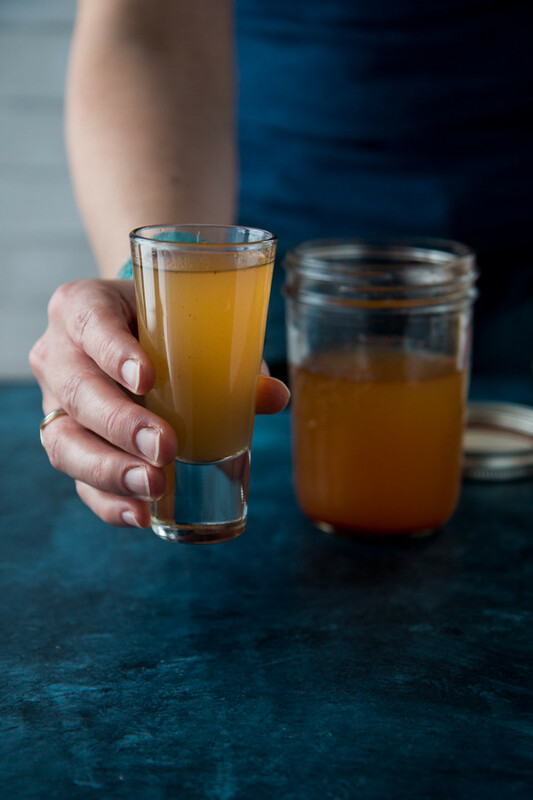 The honey (or maple syrup) have some of their own benefits, too, but mostly they make the drink taste good… which is a must, because it’s not a habit you’re going to keep up with if it tastes awful. 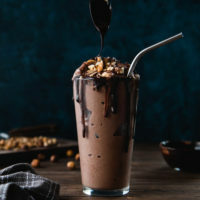 However, if you’re looking to cut out the sweeteners, you can leave them out and instead dilute the mixture with water until the flavor is mild enough that you can drink it easily. The amount of water you need will vary depending on your tastes, so experiment to find what works best for you. Do you have a healthy morning routine that keeps you feeling good all day long? Share in the comments below. And don’t forget to check back tomorrow — and the next day, and the next day — because I’ll be sharing new healthy recipes all month long! Serves: makes about 12 oz. Optionally, add a pinch of cayenne pepper, to taste. Stir or shaking until the honey has dissolved. The jar can be stored in the fridge for up to a month or so. You can drink it cold, room temp, or warmed up (on brisk mornings when I can't stand the thought of drinking something cold, I warm mine up by placing my glass in a shallow pot of simmering water for a few minutes. I try not to heat it up too much (like microwaving it) because that would kill any microorganisms in the vinegar and honey). Drink about 1 oz. every day. You can drink a shot glass in the mornings, like I do, or you can dilute a little in a tall glass of water and sip on it throughout the day -- whichever you prefer. 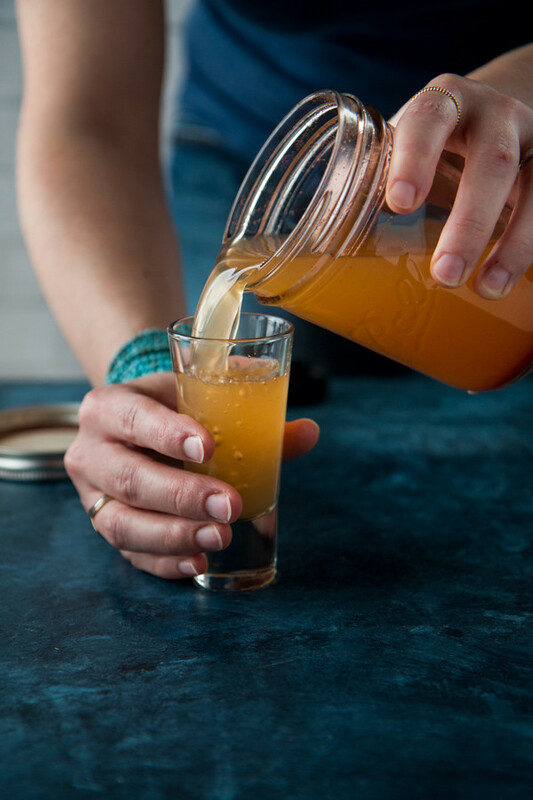 *use honey or maple syrup to taste -- the drink should be sweet enough that you can drink a shot glass full without the vinegar being too overpowering. OR, leave the sweetener out completely, and instead dilute the vinegar with water until it is mild enough to sip easily. The amount of water you will need will vary depending on your tastes, so play around to find what you like. Because the mixture is basically just vinegar and water without the sweetener, you can skip the steps of mixing it in a jar and instead just add a spoonful or two of vinegar to a glass of water each morning. Perfect timing. I just bought the apple cider vinegar and was going to search for how to make this! I never thought to make a batch and just pour a little every morning. Haha, great minds think alike! I don’t always do the batch method, but I do find having it in the fridge already mixed up makes me more likely to drink it regularly. Believe it or not I love the taste of vinegar and actually have a bottle of Bragg’s honey-vinegar, which I drink whenever my stomach needs to find a balance after a heavy meal. I’d love to try it in the morning. Right now I’m just doing warm water when I get up and I add a wedge of lemon if I feel adventurous. I love the sour taste (probably too much) but try not to give myself a sour stomach. I can’t wait for all your January recipes! PERFECT timing again Willow. my baby-sis & I are just investigating the benefits of apple cider vinegar and it’s metabolism BOOST for our weight loss new year plans. we are anxious to get started (today) and we will be checking back daily for your recipes. HAPPY, HEALTHY NEW YEAR ! Thanks, Mary Kay! Definitely try the apple cider vinegar and see how it makes you feel. 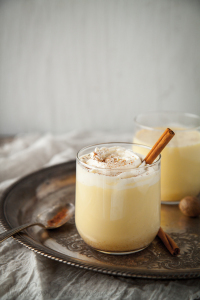 And I’m so glad to know you’ll be following along with the recipes for this month — I can’t wait to get into them! Thank you! 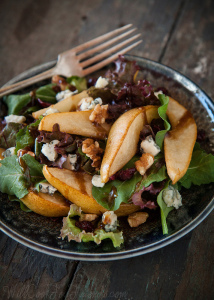 I’ve also been pinning some of your recipes. I need to jump start the new year with more healthy eating. 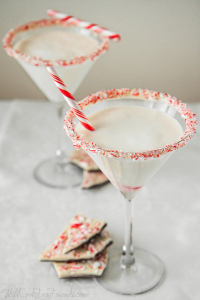 All the Christmas cookies…. Yikes! Thanks for the pins, Debbie! I hear ya about the Christmas cookies… pretty sure my family made enough to feed the whole town, haha! 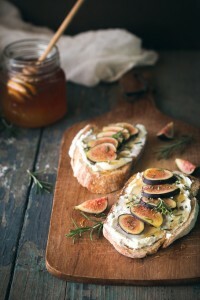 I love this idea, and what a great recipe to start with. 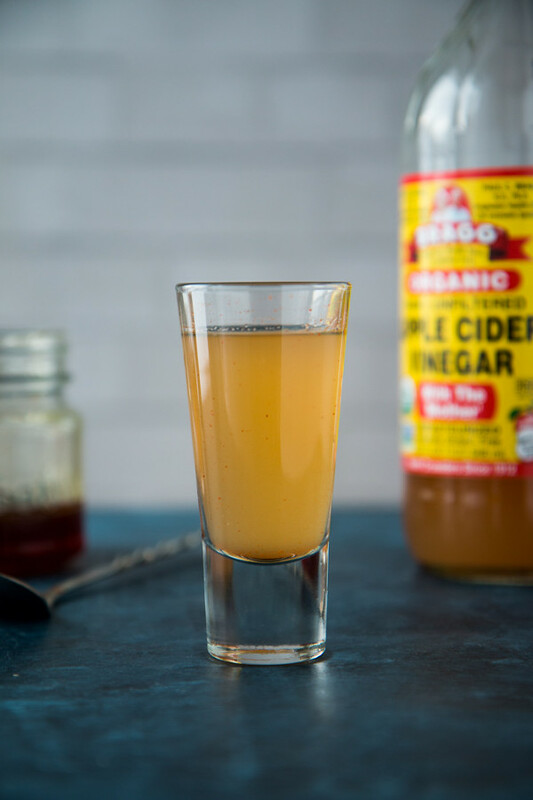 I’m a huge apple cider vinegar person, this looks like a great healthy boost! I’ve been adding a shot of ACV to my bottle of water or propel when I go to the gym and I always take a shot before bed – this would be perfect stocked in my fridge! That’s a great idea, Natalie! I’m going to have to start doing that, just adding a bit to my water bottle. Glad to hear it, Veena! I don’t always make a batch (sometimes I just mix up a little bit every morning) but I do find it helps me drink it regularly to have a jar in the fridge. I’m all over this! I started the new year with a cold, so need ALL the health benefits of ACV. Thanks! Oh noes! I’m so sorry to hear that, Lisa. Definitely drink some ACV, and I hope you feel better soon! I had no idea that drinking something acidic actually helps make the body more alkaline. I love the brand of apple cider vinegar that you chose because it is so natural and has “the mother” (strands of proteins, enzymes and friendly bacteria) in it. My mother in law uses that as part of solution to help lower her blood pressure when it gets a bit high. Thanks Thalia! Definitely give it a try. I crave vinegar after heavy holiday eating! Wow! I use vinegar, especially Apple Cider Vinegar, in so many recipes but never knew all of the great health benefits! 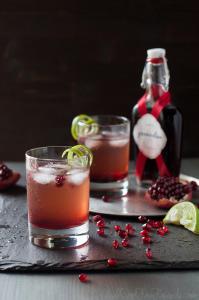 This drink looks like a great way to start off the new year and new healthy habits! That’s one of the things I love about ACV — it’s so versatile! I use it in my cooking and salad dressings all the time, too, but it really is an amazing health food all on its own. Here’s to a healthier new year! I am so inspired by this Willow. I am going to try it tomorrow morning. 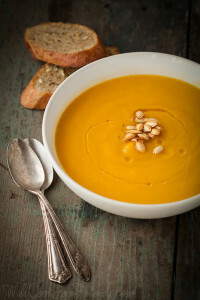 I have been having the worst reflux all holiday season long, and I hope this may help me. I will be leaving the cayanne out though for that reason. Also can’t wait to follow along with your big month! That’s quite ambitious! Thank you, Katie! I hope this helps with your reflux. And I don’t know what I was thinking, haha! It’s going to be a busy month, for sure! I did not know this much about apple cider vinegar. Good to know. I usually start my day with a big glass of kale smoothie. I mix it in with almond milk and whatever fruit I have. Can’t wait to see more of the healthy stuff. Thank you, Aysegul — it was definitely an ambitious undertaking. Gonna be a busy month! Smoothies are such a great way to start the day (and tasty, too). Thanks for sharing! Ooh, how serendipitous! Here’s to a happy and healthy 2017! Thanks Donna, glad you’re on board! i haven’t tried an apple cider vinegar booster, but i have so many friends who swear by the results. bookmarking this recipe for the future! Thanks Michelle, I hope you give it a go! A year ago I was 196 pounds I have been taking the apple cider vinegar for over 3 months, I lost 40 pounds. It is a miracle for me. I took it twice a day early in the morning with a empty stomach and before bed time. Now I stop it for 2 weeks. People even though you are taking the apple cider vinegar, you have to control what are you eating too.